Botulinum toxin is a major threat as a bioweapon due to its extreme potency and ability to cause death, its ease of production and transport, and the need for prolonged intensive care among survivors. Botulinum toxin is the most poisonous substance known to man. A single gram of crystalline botulinum toxin, evenly dispersed and inhaled, could kill more than 1 million people. It is 15,000 to 100,000 times more toxic than sarin, the destructive nerve agent used in the Tokyo subway system. There have already been several attempts by terrorists to use botulinum toxin as a bioweapon. Botulinum aerosols were dispersed at multiple sites in Japan, including U.S. military installations, on at least 3 occasions between 1990 and 1995, by the Japanese cult Aum Shinrikyo. Fortunately, the attacks failed due to inadequate microbiological technique, deficient aerosolized generating equipment, or internal sabotage. The cult members obtained their botulism spores from soil collected in northern Japan. Botulinum toxin was also used in the 1930s, during the Japanese occupation of Manchuria. Although the 1972 Biological and Toxin Weapons Convention prohibited offensive research and production of biological weapons, at least four of the countries listed by the U.S. government as state sponsors of terrorism  Iran, Iraq, North Korea, and Syria, have developed, or are believed to be developing, botulinum toxin as a weapon. After the 1991 Persian Gulf War, Iraq admitted to the United Nations inspection team that they produced 19,000 liters of concentrated botulinum toxin, of which approximately 10,000 liters were loaded onto military weapons. These 19,000 liters of concentrated toxin are not fully accounted for and constitute approximately 3 times the amount needed to kill the current human population by inhalation. The neurotoxic agent sarin is the most poisonous substance known. It is unfortunate that botulinum toxin needs to be considered as a biothreat at the historic moment when it has become the first biological toxin to become licensed for treatment of human disease. In the U.S., botulinum toxin is currently licensed to treat neck deformities such as torticollis and a variety of eye deformities that cause squinting or twitching movements. The effects of a potent neurotoxin produced from Clostridium botulinum create botulism, an anaerobic, spore forming bacterium whose natural habitat is soil. There are seven recognized types of botulinum neurotoxins. Human botulism is caused by strains of botulism that produce toxin types A, B, and E. Botulinum toxin blocks the transmission of acetylcholine across the junction between nerves and muscles, producing muscle paralysis, including paralysis of respiratory muscles. 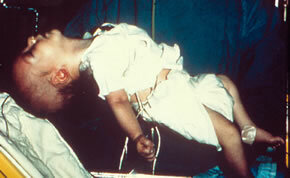 The picture shows a six month old suffering extreme flaccid paralysis produced by botulinum toxin. Note the lack of muscle tone, especially at the neck. Three forms of naturally occurring human botulism exist: foodborne, wound, and intestinal. Fewer than 200 cases of all forms of botulism are reported annually in the U.S. All forms of botulism result due to absorption of botulinum toxin into the circulation either from a mucosal surface such as the intestine or lung, or from a wound. Botulinum toxin does not penetrate intact skin. Inhalational botulism is a man-made form that results from manufacturing botulinum toxin in an aerosol form and distributing it among an unsuspecting population. Botulinum toxin is colorless, odorless, and tasteless. The toxin is readily inactivated by heat; thus, foodborne botulism is always transmitted by foods that are not heated, or heated thoroughly before eating. The most commonly implicated foods in the U.S. are home canned or home processed vegetables, meats, fish, fermented or salted fish products, whale or seal products, relish, chili peppers, and salsa. Foil wrapped baked potatoes kept at room temperature for long periods of time after baking have also been the source of botulism in restaurants. Garlic cooked in oil, sautéed onions kept in butter sauce, and cheese sauces have also been implicated in outbreaks of foodborne botulism. Inhalation botulism is a man made form of the disease that involves manufacturing botulinum toxin in an aerosol form and distributing it among a population. Botulism symptoms begin with cranial nerve dysfunction affecting the muscles of the head and neck. The first symptoms include difficulty seeing, speaking, and/or swallowing. Prominent neurological findings include ptosis or drooping eyelids, diplopia or double vision, blurred vision, often enlarged or sluggishly reactive pupils, and difficulty speaking and swallowing. Sensory changes do not occur except for hyperventilation as the patient becomes frightened by the onset of paralysis. The rapidity of onset and severity of botulism depend on the rate and amount of toxin absorption into the circulation. Typically, patients who have foodborne botulism begin to experience symptoms between 12 and 72 hours after the contaminated meal. Botulism can be recognized by a classic diagnostic triad that includes symmetric, descending flaccid paralysis with prominent bulbar palsies in an afebrile patient with a clear sensorium. Bulbar palsies refer to weakness or paralysis of muscles of the head and neck needed for normal speech and swallowing. The prominent bulbar palsies associated with botulism are also known as the 4 Ds  diplopia (double vision), dysarthria (difficulty moving facial muscles to pronounce words). dysphonia (difficulty speaking), and dysphagia (difficulty swallowing). As paralysis extends beyond bulbar musculature, loss of head control, weakened muscle tone, and generalized weakness become prominent. Dysphagia and loss of a protective gag reflex may require intubation and mechanical ventilation. In untreated persons, death results from airway obstruction due to pharyngeal and upper airway muscle paralysis and inadequate tidal volume due to paralysis of the diaphragm and accessory muscles of respiration. The first symptom of botulism is respiratory distress. in its absence of sensory nerve damage. Clinical diagnosis of botulism is confirmed by specialized laboratory testing that often takes days to complete. Routine lab tests are usually unremarkable. Therefore, clinical diagnosis is the foundation for early recognition of and response to a bioterrorist attack with botulinum toxin. Botulism and botulinum toxin are not contagious and cannot be transmitted from person to person. Treatment for botulism should be delayed until laboratory tests confirm the diagnosis. Therapy for botulism consists of supportive care and passive immunization with botulism antitoxin. Antibiotics have no effect on botulinum toxin. Administration of antitoxin will minimize subsequent nerve damage and the severity of the disease, but does not reverse already existing paralysis. Use of botulism antitoxin for post exposure prophylaxis is limited by its scarcity and potential complications. There are also few published data on the safety of botulism antitoxin. Due to the potential risks of equine antitoxin therapy, it is less certain how to best care for persons who have been exposed to botulinum toxin but who are not yet ill.
Botulism patients require supportive care that includes feeding by enteral tube or parenteral nutrition, intensive care, mechanical ventilation, and treatment of secondary infections. Patients with suspected botulism should be carefully monitored for impending respiratory failure. Botulism patients should be assessed for the adequacy of their ability to gag and cough, ability to control oropharyngeal secretions, and indicators of respiratory function such as oxygen saturation, vital capacity, and inspiratory force. The proportion of patients with botulism who require mechanical ventilation ranges from 20% to 60%. A reverse Trendelenburg position may postpone or avoid the need for mechanical ventilation in mildly affected patients because of improved respiratory mechanics and airway protection. With this position, the patient is placed on a flat mattress tilted at 20 degrees. A tightly rolled cloth can be used to support the cervical vertebrae and bumpers can be used at the foot of the bed to prevent the patient from sliding downward. For those patients who survive, eventual recovery from botulism results from new motor axon twigs that sprout to reinnervate paralyzed muscle fibers, a process that may take weeks or months to complete. In a large outbreak of botulism affecting a major metropolitan area, the need for mechanical ventilators, critical care beds, and skilled personnel might quickly exceed local capacity and persist for weeks or months. A reverse Trendelenburg position may delay the need for mechanical ventilation in a patient with botulism. An outbreak of a large number of cases of acute flaccid paralysis with prominent bulbar palsies. An outbreak with an unusual botulinum toxin type. An outbreak with a common geographic factor among cases (e.g., air travel, work location), but without a common dietary exposure. Multiple simultaneous outbreaks with no common source.